Born February 21, 1909 in Philadelphia, Arthur Abrams began drawing as a child of five, and continued producing art until just before his death in Sarasota, Florida during 1981. He began studies at the Graphic Sketch Club of Philadelphia, later teaching and exhibiting there. 1924 brought a scholarship to the Philadelphia College of Art, but his lack of interest in commercial art had him move to the Pennsylvania Academy of Fine Arts. at his School Fine Arts, Munich, where he became further convinced that art did not have to consist of a photo like quality of an object, but could be concepts, of personal expression of the artist. He toured around with other artists into Italy and Spain, meeting the artists of the day and painting. While painting around The Sacre Coeur some man, 'slightly under the weather' asked if he were an American. He replied that he was, and asked if he and the man had met at the Picabia exhibition, the man said they had, and his name was Maurice Utrillo. He told Arthur that if he remained there in France he will become a great painter, but if he went back to America he would become a businessman. He did return to America at the end of 1929 because his scholarship money was about gone. He had a one-man show in McClees Gallery, in Philadelphia, putting the proceeds of the sale in the Bankers Trust Company, which he lost when the company failed. He then traveled between Philadelphia and New York. In 1931, he did some traveling to Elmira to visit Sally Frank whom he had met in Philadelphia, and he also did and painting and sketching around the area. While sketching on the Louis Hoftrup farm near Elmira, Hoftrup came up to him and said he had a brother Lars, who was an artist living in New York and said Arthur should look him up when back in New York City. In September of 1931 his first New York one-man show was held at the Fifteen Gallery on West 57th Street. This was a gallery owned by artists to by-pass restrictive dealers and high commissions. Unfortunately a number of his paintings were kept in a studio in the Lincoln Arcade Building when it burned down. Still mainly in New York he became a charter member of the American Art Congress, and later of Artists' Equity. In the summer he went to Elmira where he, Lars Hoftrup and Armand Wargny began to turn a barn and farm into the Rustic Studio for artists to come and paint during the summer months. In a year or two Rochester Memorial Art Gallery opened their doors to the Elmira artists. He married Sally Abrams in October of 1931, and began designing store fronts, for his father-in-law who was a glass maker. He also did some sculpture and portraits during the 30's. He then opened the Art Shop, in Elmira, and lectured at Hobart, Syracuse, Cornell, the Ithaca Art Association, Elmira College, often holding classes and exhibiting his works at the places in conjunction with his teaching & lecturing. During W.W.II he closed his shop and joined the Army Camouflage "Phantom Troops", was in the Normandy landing, the Ardemes, the invasion of Germany at Remagin, then liaison work with the French and later with Displaced Persons. On his return, at the end of the war he re-opened the Art Shop in Elmira, added restoration work and became an accredited appraiser. He made business trips to Europe markets buying art for his growing list of patrons. In 1950 he was elected as president of the Elmira Art Club. In 1966 he sold the Art Shop and moved with Sally to Philadelphia, to rid himself of business and concentrate on his art. A long time friend from the Philadelphia Academy of Fine Arts convinced him to move to Taos, New Mexico where there was a solid art colony and Sally's arthritic problem would be helped. In 1969 they made the move. He studied the different type of landscape there, and then began to paint in a new style, abstract impressions of the mountains and deserts followed. He found quick success. 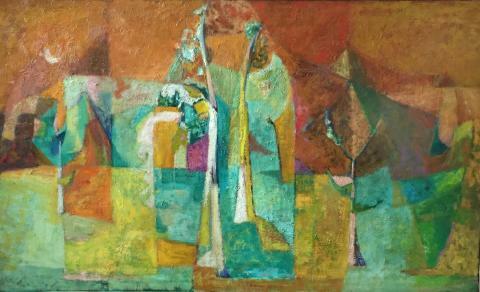 The jury of the Taos Art Associations Annual Awards Show chose one of his works in 1970, which was later in local newspapers with his biography. He soon was having one-man shows. He was one of four New Mexican artists to be represented in a 1972-73 traveling exhibition. The exhibition traveled to about twenty museums and universities. However the cold winters were hard on Sally's arthritic condition, he thought of where to move, considering Mexico, but his son said the West Coast of Florida was beautiful and no cold weather to worry about. Arthur and Sally drove there, for a vacation, while in Sarasota saw a house, Arthur took the sign from in front of the house and drove to the realtor and bought it on the spot. 1973 was difficult as he had no more mountains and dramatic landscapes, but as he studied the flat areas along the beaches and saw the different types of light the setting sun made he switched to his abstract feelings of the area, and was soon a popular 'new artist' in the area. He exhibited in area galleries and sold works from his home studio until cancer, which he had battled for many years ended his life on August 28, 1981. In keeping with his independent character when he asked the doctors if there was anything else they could do for him and learned there wasn't, he checked out of the hospital to have his final days at home with his wife, and his art.